Description: The Metro Quadrato Wall Sconce features stunning Frosted Rainy Glass panels that reveal a White Glass cylindrical diffuser. The appealing wall fixture is enhanced with Solid Brass hardware finished in a Brushed Nickel. Handcrafted by highly skilled artisans in our 180,000 square foot manufacturing facility in Yorkville, NY. Custom sizes, styles, colors and dimmable energy efficient lamping options are available. 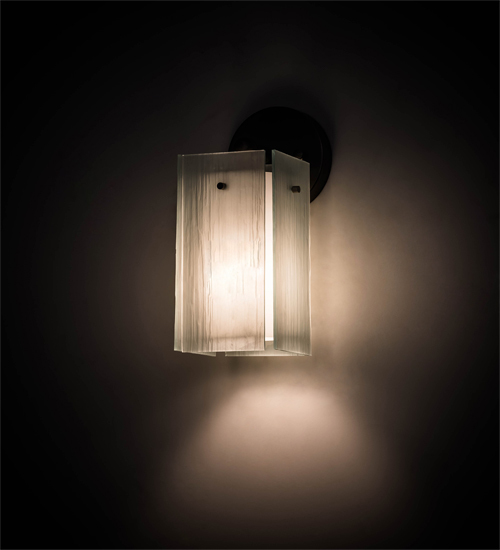 The wall sconce is UL and cUL listed for dry and damp locations.